Whether in tea, ginger ale or eaten with food, ginger has been used to treat nausea, indigestion and diarrhea for thousands of years. In addition to its traditional use as a digestive aid, ginger is a good source of some vitamins and minerals that are essential to men's health. 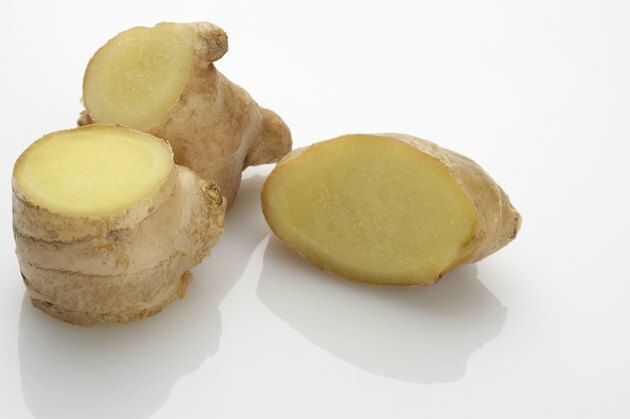 Potentially helping to prevent colorectal cancer, heart disease and diabetes, ginger can play a vital role in ensuring that men live long, healthy lives. According to the Centers for Disease Control and Prevention, heart disease is the leading cause of death among American men. Ginger may help to prevent heart disease, as it is a good source of vitamin B-6, magnesium and potassium, with 0.1 mg, 5 mg and 46 mg in 5 fresh slices, respectively. While vitamin B-6 helps lower your risk of heart disease, magnesium and potassium can help to lower your blood pressure. As high blood pressure is a risk factor for heart disease, these three compounds all help ginger to reduce your risk of developing heart disease. The CDC states that colorectal, or colon, cancer causes the second highest number of cancer-related deaths in the United States. As colon cancer affects men more than women, ginger's potential to prevent colon cancer is vital to a man's health. In a study published in the July 2009 issue of "Cancer Research," a team led by Chul-Ho Jeong at the University of Minnesota state that gingerol, the compound that gives ginger its spicy flavor, may help to treat and prevent cancer. Based on these findings, the National Institutes of Health are currently conducting clinical trials exploring ginger's use in chemoprevention for colon cancer. Diabetes affects nearly 12 percent of men over the age of 20 in the United States. As part of a healthy diet, ginger may play a role in the treatment of diabetes due to its manganese and magnesium content. The University of Maryland Medical Center suggests that these minerals help to regulate blood sugar in both diabetic and non-diabetic men, with blood concentrations of these minerals lower than average in people with diabetes. As such, ginger may be essential to preventing both the development of and complications that may arise from diabetes in men.